Peoples Water Service has no lead water mains is the system. Some components that have lead include older fire hydrants, brass fittings installed before 2014 and lead or copper service lines. There are approximately 86 lead service lines in the city and are mostly in the older areas of the town. Streets include East and West Madison, West Hickory, West Jefferson, East Pine, South Franklin, North and South Washington, East Cypress, Jackson, Elm, McFee, Fairfield and Huey. In a continuing effort to reduce any lead in the finished water delivered to homes, Peoples Water Service uses only low lead fittings, is changing out older meters with low lead meters, and adding corrosion control to treat the water. More information about lead in drinking water can be found at https://www.epa.gov/ground-water-and-drinking-water/basic-information-about-lead-drinking-water#getinto. Peoples Water Service of Bastrop received highest honors this year at the Louisiana Rural Water Association's Awards Banquet when they were named the 2015 Private System of the Year. The award was presented on July 15, 2015 at LRWA's 30th Annual Training and Technical Conference held in Lake Charles Louisiana. The LRWA Awards Program was established to recognize the outstanding efforts of Rural Water and Wastewater Systems and their personnel. 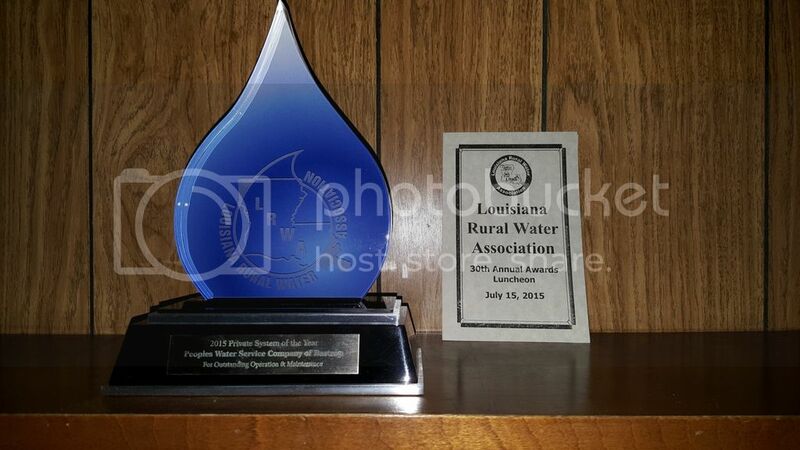 Of all the systems across the state, Peoples Water Service of Bastrop was selected as this year's winner for their dedication to providing safe drinking water and/or helping to maintain a cleaner environment through their efforts in the water industry in the State of Louisiana. Click on the smiley to see the award! Recently, Peoples Water Service Company has activated an online social media Twitter account (PWSBastrop01). This account was created to assist us in the delivery of important information or any emergency notification to you. We encourage all customers to follow us on Twitter. To open a Twitter account, please click here .